Location. 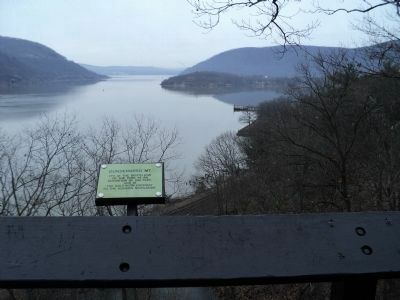 41° 19.108′ N, 73° 59.224′ W. Marker is in Bear Mountain, New York, in Rockland County. Marker can be reached from New York State Route 9 W, on the right when traveling north. Touch for map. Marker is located on a walking trail through the zoo at Bear Mountain State Park. Marker is in this post office area: Bear Mountain NY 10911, United States of America. Touch for directions. Other nearby markers. At least 8 other markers are within walking distance of this marker. Bear Mt. Bridge (here, next to this marker); Anthonys Nose (here, next to this marker); Ancient Canyon (here, next to this marker); Railroads (here, next to this marker); Scenic Road (here, next to this marker); Boundaries (here, next to this marker); Hudson River (here, next to this marker); Iona Island (here, next to this marker). Touch for a list and map of all markers in Bear Mountain. 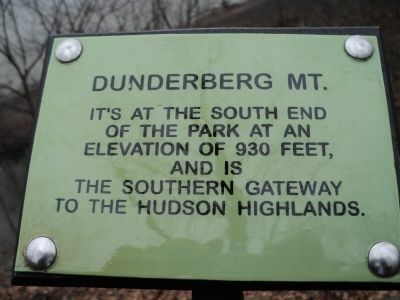 Dunderberg Mountain can be seen behind the marker on the Hudson River. More. Search the internet for Dunderberg Mt.. Credits. This page was last revised on June 16, 2016. This page originally submitted on April 3, 2012, by Bill Coughlin of North Arlington, New Jersey. This page has been viewed 312 times since then and 4 times this year. Photos: 1, 2. submitted on April 3, 2012, by Bill Coughlin of North Arlington, New Jersey.